After volunteering and working with various environmental and human rights causes, Gene turned his attention to animal agriculture. He has conducted hundreds of visits to farms, stockyards, and slaughterhouses to document conditions, and his pictures and videotape, exposing factory farming cruelty, have been aired nationally and internationally, educating millions. He has testified in court and before local, state and federal legislative bodies, and has initiated groundbreaking legal enforcement and legislative action to raise awareness and prevent factory farming abuses. He played a significant role in passing the first U.S. laws to prohibit cruel farming systems – including Proposition 2 in California, the Florida ban on gestation crates, the Arizona ban on veal and gestation crates, and the California and Chicago bans on foie gras. His efforts have been covered by leading news organizations, including the New York Times, The Larry King Show, Los Angeles Times, Chicago Tribune, Wall Street Journal, Washington Post, National Public Radio, ABC, NBC, CBS, and CNN. His book, entitled Farm Sanctuary: Changing Hearts and Minds about Animals and Food, was published by Simon and Schuster in March, 2008 and has become a National best seller. Available wherever books are sold. 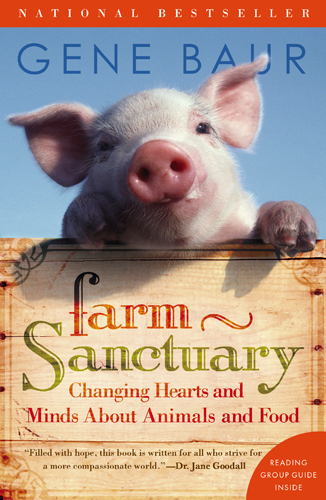 100% of the author’s proceeds from the sale of this book will be donated to Farm Sanctuary.